Klein Sun Gallery is pleased to announce Photography Autocracy, a solo exhibition of mixed media installations by Beijing-based artist Cai Dongdong, on view from November 30, 2017 through January 6, 2018. With a strong background in photography and image production theory, Cai Dongdong’s practice reaches beyond photography - it is a topology of image. In Cai’s installations, a photograph may serve strictly as a reference point or a gateway towards the story Cai is constructing or reconstructing. Works of master photographers such as William Eggleston, Stephen Shore, and Lewis Wickes Hine have the ability to pull viewers into a particular time or location. Part of this power came from the fact that these photographers lived contemporaneously with their photos. On the contrary, images used in Cai’s work often came from a time before Cai was born, a nostalgically tumultuous time in China. The world presented by Cai is not a full reconstruction of the old times, but a paradoxical coexistence of the past and the current. When you start a conversation with Cai’s work, you will gradually realize its subtle compatibility away from the world that the work is seemingly set up in - this is when the utopia of the past is breached. To Cai, images nowadays subconsciously exert an autocratic control over people’s mind the same way that he applies a variety of artistic techniques to make all the images in his work “act against their will”. In Aiming at the Camera, The Photographer, and ERA Photographic Paper, Cai looks at the occupation of photographer and playfully maneuvers images that he collected in association with objects often used in photography such as a camera, a tripod, a sheet of photographic paper or lens of various sizes. These objects seem alien or even bizarre at times, but ignite a unique interaction with the images to the extent that the story will not stand without any of the components. In The Association of the Cannon, Big Harvest, The Armed Lace, and Obstacles, collectivism is a focal point of discussion which is a key concept in the Chinese communist ideology. Collectivism is not directly promoted currently in China, but the influence has been ever-lasting and still impacts many aspects of society. Analogies have been made between Cai’s practice and the work of Marcel Duchamp, however earlier collage works by Max Ernst might be a more appropriate comparison. In Two Children Are Threatened by a Nightingale, for example, Ernst adds three dimensional objects to his canvas to create an irrational and surreal story. 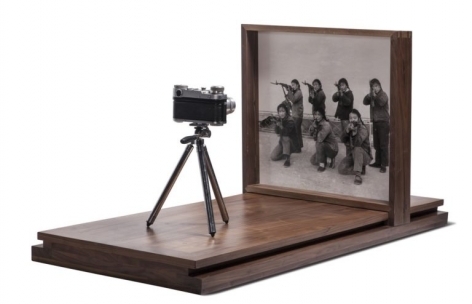 While Ernst’s volumetric objects are supplements to his canvas, Cai’s application of alien objects together with his hand-made wood compartments and frames share equal importance with the images in his narrative. All these elements join hands with the photographs to make Cai’s work a nostalgic piece of history that links us to the present as well. Cai Dongdong was born in Tianshui, Gansu, in 1978. Recent group museum exhibitions include Évidences du réel: La photographie face à ses facunes, Musée d'art de Pully, Pully, Switzerland (2017); Bizarreland, Exhibition of Chinese and Contemporary Photography, Nantong City Center Art Museum, Nantong, China (2017); Working on History. Contemporary Chinese Photography and the Cultural Revolution, Staatliche Mussen zu Berlin, Berlin, Germany (2017); The Exhibition Go Annual Contemporary Art in China, Beijing Minsheng Art Museum (2016); Silk Road International, Art Museum of Nanjing University of Arts, Nanjing, China (2016); New Capital: Huang Yu Collection Exhibition, Museum of Contemporary Art, Chengdu, China (2016); Guns and Roses, Kunstraum, Potsdam c/o Waschhaus, Germany (2016); Links – Locality and Nomadism, The Galaxy Museum of Contemporary Art, Chongqing, China (2015-2016); Beyond the Earth – The First Xi’an Contemporary Photography Exhibition, Xi’an Art Museum, Xi’an, Shaanxi Province, China (2015); Chinese Photography: Twentieth Century and Beyond, Three Shadows Photography Art Centre, Beijing, China (2015); Unfamiliar Asia: The Second Beijing Photo Biennial, CAFA Art Museum, Beijing, China (2015); China 8: Contemporary Art from China on the Rhine and Ruhr, Folkwang Museum, Essen, Germany (2015); 2nd Three Shadows Experimental Image Open Exhibition, Three Shadows Photography Art Centre, Beijing China (2015); and Pull Left – Not Always Right,”Urban Arts Space, Ohio State University, Columbus, OH (2014), Hillstrom Museum of Art, Saint Peter, MN (2014); and Unboundedness, China Cultural Center, Berlin, Germany (2013-2014). 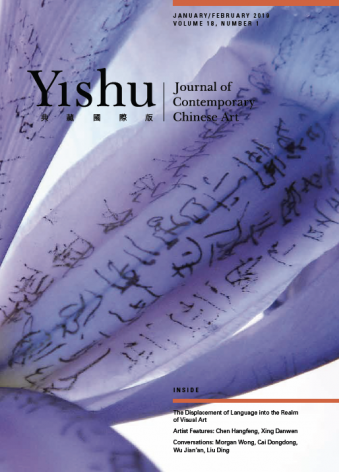 Cai Dongdong's interview with Tansy Xiao is feature in Yishu Journal's January/February 2019 issue. Cai Dongdong's exhibition Photography Autocracy featured in Art Radar. 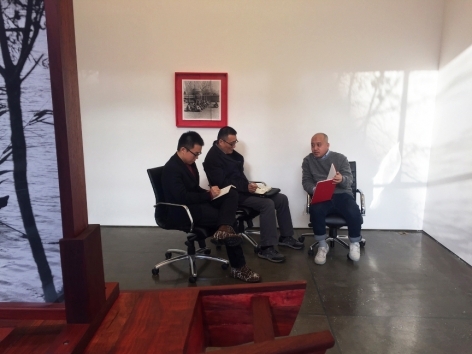 An Interview with Cai Dongdong and Phil Cai, the gallery manger at Eli Klein Gallery.